Following the world reveal of Black Ops 3 zombies, fans are actually more excited for The Giant, a Der Riese remake with the original characters, than the alien infested Film Noir map known as Shadows of Evil. For some reason, Treyarch prohibited video recording from inside the Comic Con event, asking attendees to turn off mobile devices and tablets as soon as the panel started. Some videos escaped and made their way onto YouTube, only to be taken down with Copyright warnings within a couple of hours. Thankfully, we now have a High Quality video of The Giant from Treyarch themselves, ready to drool over and dissect in anticipation before November. In this post I'm going to talk through the trailer, put the story back together from where we left off in Origins and now the reconnection to WaW and Der Riese. It's a little confusing but bare with me and all will become clear. 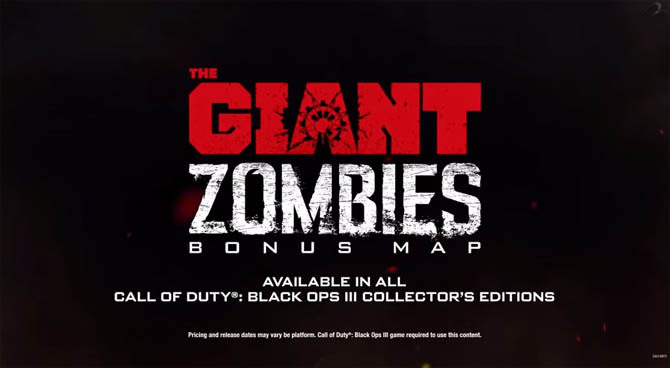 As you may already know, The Giant is a bonus map for Black Ops 3 and because of this it's only available to those who purchase the Season Pass or high level editions such as Hardened and Juggernog. That might be a financial problem for you, but ask yourself this, would you be happy playing only Shadows of Evil in November? I for one wouldn't be. You may remember an audio file from the original Der Riese map where Richtofen teleports Samantha and Maxis away so he can gain full control over the zombies, at which point Richtofen laughs and the audio cuts off. This was the last audio file from Die Riese and is included at the beginning of The Giant trailer. At this point, time has stopped following the teleportation of Maxis and Samantha. Several of the Origins characters are teleported to Der Riese but excluding Richtofen. He's the only one that's still from the WaW timeline and thus a future version compared to the others. Just look at his appearance, he's clearly older. Remember, Origins took place before Die Riese (timewise) even though the map was released after. 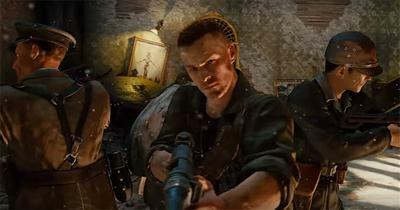 So we have Origins Takeo, Dempsey and Nikolai, but a Der Riese Richtofen. The Origins crew desperately attempt to convince Richtofen to NOT open the door to the teleporter. 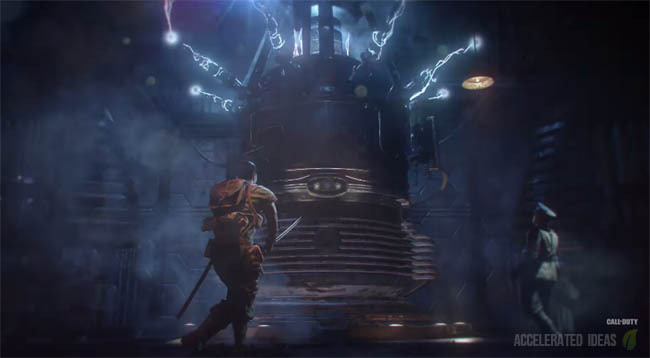 Richtofen ignores the pleas from his compatriots and continues activating the teleporter. The Origins Richtofen (younger version) appears in the teleporter. The Der Riese version is giddy to see his younger self, immediately taking off his hat as a show of respect. At which point, BAM! Shot to the head and Der Riese version of Richtofen is now dead, cutting the future timeline for Richtofen out of the zombies story. Now that we know Richtofen has changed the future storyline what does this mean for zombies? Well, the shared theory is that Richtofen is now in control of the story line and all the events from Shi No Numa all the way up to Moon no longer exist - this is Richtofen's chance to finally fix things and make things right. Samantha no longer needs to extract revenge on Richtofen for teleporting her and her father, thus the Earth is no longer destroyed through the Big Bang Theory Easter Egg on Moon, leading to Tranzit. For us as players, this means that the timeline starting from Der Riese can now be completely rewritten from a different perspective. It corrects all the mess that Richtofen left and blanks the canvas for the storyline. This doesn't necessarily mean that the future will be any better than what Richtofen had in mind though, it could easily be worse. We won't know for sure what direction Treyarch takes things in, until at least the ending of The Giant or the first DLC for Black Ops 3. I guess they'll want to take players to brand new locations but with tie ins to Samantha and her reasons for changing the future.